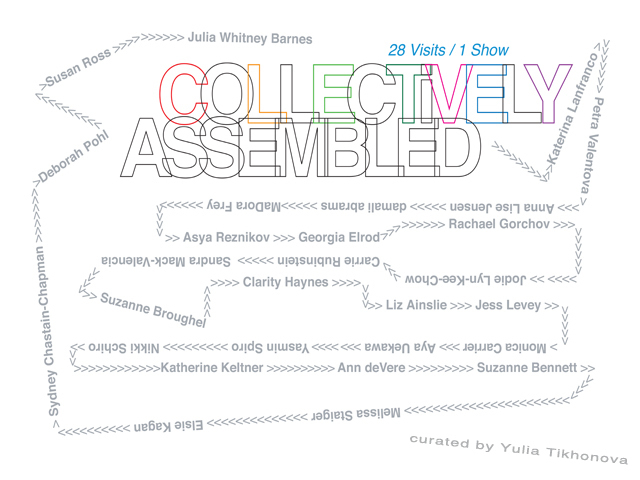 The feminist visual arts collective tART opens its Studio Visit Exquisite Corpse show at 5p on January 26. For more details follow the jump. Collectively Assembled: 28 Visits, One Show is rooted in the origins of tART : the studio-Visits, and draws from the idea of the Surrealist game Exquisite Corpse. The studio visit was the original building block of tART and remains as an integral part of the collective. It acts as key to the communication, success and productivity of tART and our members. In the game Exquisite Corpse, a folded piece of paper is passed artist to artist for each to draw on, then fold and cover their work , and pass to the next artist . Unfolding the paper at the end reveals an unforeseen composition or Exquisite Corpse. Collectively Assembled is constructed in a similar manner to the game in which each creative decision sequentially influences the next. Over one year, a chain of scheduled studio visits builds the exhibition. One member visits another’s studio and selects work for the show. The receiving member then interprets what she feels is central to her selected work. With that concept in mind, she goes on to visit another member’s studio to select work. The process continues until it circles through every member. The resulting exhibition features not only each member’s work, but also each member’s interpretation and response to another member’s choice of work, thus creating a gestalt- the show itself. We have tracked the process via a blog, http://tartcollective.blogspot.com/. Each visiting member posts her selection and explains her selection process. The blog will complement the final show giving the viewer intimate engagement with the process of creating the show. Consideration of the subjectivity of curating is witnesses through the roles of personal and collegial dynamics within the collective. The final installation is overseen by visiting curator, yulia tikhonava. She will not partake in individual studio visits, but will contribute to the aesthetic presentation of the show. This will be the final unfolding, the visiting curator’s presentation of the body of work selected from the studio visits.